A young aviator makes his mark online, the Internet of Things creeps into aviation, Spirit Airlines plans to expand, a secret airport security check, and the Solar Impulse 2 starts an around the world journey. Daniel Morley is a college student studying Human Factors in Aviation at Nova Southeastern University, and he’s training to become a commercial pilot. Daniel is also the Social Media Manager at Airline Geeks. He helps manage social media, pushes articles, interacts with readers, and occasionally writes articles. Follow Daniel at @MorleyThePilot on Twitter and visit his Facebook page. The Internet of Things (IoT) is the concept where physical things in our lives have sensors and computational power, but they are also interconnected and share information. This article looks at some of the ways that IoT might impact the airline industry. Spirit Airlines calls itself an Ultra Low Cost Carrier, and they plan to bring on new aircraft and flights in 2015. To do that they need more people – 1,500 more people in 2015, 500 of them flight attendants. Jonathan Corbett was questioned at Heathrow by an American Airlines security contractor, who asked why he was traveling and for how long. Corbett was told that if he didn’t answer the questions, he couldn’t board his flight home. In later communication with the airline, he learned that this is program is directed by the DHS/TSA, but the details are SSI, Sensitive Security Information. Corbett’s blog is TSA Out of Our Pants! and details and documentation are in the post Corbett Sues TSA Over International Security Interview Program. The Solar Impulse 2 aims to be the first aircraft to fly around the world on solar power. It launched from Abu Dhabi on March 9, 2015 and is planned to take over 5 months to accomplish the planned 25 flight days. Grant’s back from the Canberra Balloon Spectacular in time for the Melbourne Grand Prix, but it seems Red Bull aren’t happy with how that’s going. Hey, maybe they’ll put money into more aviation events? 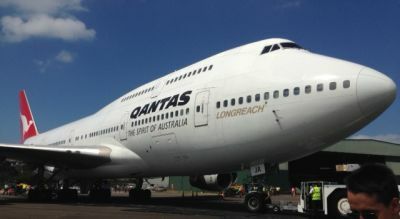 At least the Qantas 747 handling display was pretty awesome. Meanwhile, Qantas were the subject of the latest Facebook scam: Thousands fooled by fake Qantas first-class giveaway on Facebook, More than 100,000 people fooled by free Qantas flight scam, Not like! Thousands duped by fake Qantas Facebook offer. Australia and New Zealand are sending relief flights to Vanuatu after the island was hit hard by Tropical Cyclone Pam. Educator Joël Vojenis from Lapalisse (LFHX) France tells us about taking his students on a parabolic flight. Titan-II.com – Dedicated to the men and women of the United States Air Force that served within the Titan II system. This entry was posted in Episodes and tagged IoT, solar, Spirit Airlines, TSA on March 18, 2015 by maxflight. Hi from episode 336. I was a skydiver many years ago, and your link about Cooper jumping a B727 might not be actuate way back in the 1970’s. This was not a sport jump. I believe he only had one parachute. Two would be to obvios. Back then their was mostly military style parachutes. They did not have pins, holding the chute in the deployment bag. They had rubber bands. Doubt it was packed by a rigger. That would be another sourch for the government to find him. We used surplus army chutes, and cut out a few Gores (panels) to make them steerable. And those chutes are camouflaged. I suspect he jumped before. Because never finding his equipment, indicated he had experience. I would like to know if you have a program to help someone like me who’s 46 years young obtain a pilots license via school loans or grants or whatever it is you may know about that I don’t know of. I see there are plenty of financing deals for minorities on one site, but nothing for citizens, and I figured there is or should be something I may not be aware of. I have spoke with ATP but I’m not sure if they are the best way to go, and would love to know if you have something that can help me out here. I would appreciate all your help, and info to help me get my pilots license so that I can begin doing something that’s been a desire of mine for years, and I would love to be able to make money doing something that I love doing. That’s true success to be able to earn money doing something you truly love, and enjoy, and that’s what I plan to do, but can use all the help I can get please. Your time, and cooperation is appreciated. Kyle: You should have a look at http://www.aviationcareerspodcast.com/. Lots of good resources and advice there.